hankfully, today couldn’t have been much more of a contrast to yesterday. We had a much shorter distance to walk and most of it was over pavement once the first hour or two of scrambling between Lamorna and Mousehole was out of the way. Leaving Lamorna we were able to look across the cove and see properly for the first time the terrain we’d walked over in the dark the night before. Although the path looks ruler-flat, it also looks exposed and we shook our heads afresh over our folly. We left a Bookcrossing book on the path where it turns a corner out of the cove, hoping it would catch the eyes of both day and long-distance walkers, but never heard of it again. At the nature reserve in the woodlands above Zawn Organ we found some art installations made from branches and other natural materials – photos inevitably followed. It wasn’t long, though, before we were off the path and on a pleasant but thoroughly domestic stroll through some of Cornwall’s most historic communities – Mousehole, Newlyn, Penzance and Marazion. In Mousehole we strolled down little streets not really big enough for cars – very reminiscent of St Ives, full of little granite cottages and flowers. We sat on a bench by the harbour, drank cans of lemonade shandy and watched a youth band setting up for a concert. On the way to Newlyn we stopped briefly at the memorial to the dead of the Penlee lifeboat disaster and, once in the town, saw some of the fishing fleet in the harbour and stopped for a sandwich on a bench outside the famous art gallery. One day we’ll get there when it’s open. In Penzance we finally discovered where the seafront is, wished we had the time and opportunity to go for a swim in the famous outdoor sea-filled Jubilee swimming pool and bemoaned the lack of decent seafront chippies open on a Sunday. Then we wandered across to the station, just taking care to sit briefly at the bus stop where our open-top bus had departed for Sennen two days before, read a Sunday paper and drank a couple more cold cans before locating the three-mile path to Marazion. On that path we watched Intercity trains coming and going, found out where they keep the sleeper carriages during the day, watched a number of sea-going yachts with spinnakers out having a race and enjoyed the spectacle of St Michael’s Mount coming ever closer. It wasn’t challenging and, after the previous day’s excitement, we weren’t sorry. When we arrived at our B&B we were able to watch the Indianapolis Grand Prix and the latest episode of a crime thriller that we had been following as well as doing some general housekeeping like washing clothes. In short, the day was far more like a normal holiday and far less like the usual route march. This led us inevitably to question why on earth we were slogging our way through a walking holiday when we could have been lounging around in St Ives refining the art of doing not very much at all. The reasons that we have given in the past are as follows: because it is good exercise and good for the soul; it is character building and a complete contrast to everyday life; because you get access to beautiful scenery that you wouldn’t see any other way. Well, all of those still hold true. But the reason “because it’s there” seems to be one of the strongest now. We walk it because it’s there for us to walk and because we’ve done this every year since 1997 and most other things including our choice of holidays have changed beyond recognition. We have always assumed that we would finish all 630 miles and now we’re locked into it, even though slogging up and down hills carrying heavy weights may not be quite as much fun as it once was now we can afford to go abroad now and then. We questioned whether we should give it all up. With the half-way point finally reached on this trip, and a logical break at Falmouth, it seemed a question worth asking. Another reason we started was because we were very familiar with the area round Minehead and also spent a lot of time in north Cornwall. So we’ve spent the last six years walking in areas that we know well and like. But past the Lizard? 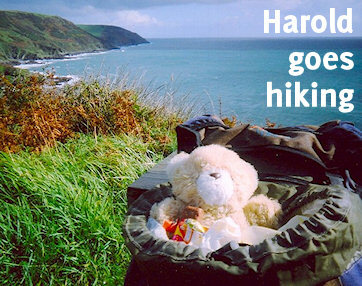 We’ve only paid a few fleeting visits to places on the south coast – Polperro, Looe, Lyme Regis and Swanage. From now on, we’re going into the blue. And, we discover, we have found our limit – it’s about 14 miles tops while carrying the rucksacks and over reasonably challenging terrain. It’s certainly less on strenuous ground and it isn’t a comfortable stroll – that means coming in late and very tired, and couldn’t be done in bad weather. Here we have learned something that we possibly set out to learn. So after Falmouth it’s time for a whole new look at how we do this. Off into the blue in more than one sense.